A sport often referred to as the most dangerous of all forms of fighting competition, Mixed Martial Arts is also renowned for its multidimensional fighters... Learn about what it takes to succeed in one of the most demanding sports in existance. MMA competition, as distinct from other fighting events, has its own unique set of protocols, rules and battle tactics. In its current form it is one of the more technical and demanding sports in existence, as it requires from its fighters a tremendous amount of skill, stamina, heart and determination. A sport often referred to as the most dangerous of all forms of fighting competition, Mixed Martial Arts is also renowned for its multidimensional fighters, fighters who have mastered several different types of martial art and have combined these to maximum effect. A complete MMA fighter is indeed the ultimate fighting machine, and the programs they use to reach this level demand complete sacrifice. As one of today's more popular fighting sports MMA has captured the imagination of many aspiring fighting champions, as not only is it firmly rooted in many years of martial arts history and tradition - it evolved from both 1920's Brazilian Vale Tudo (anything goes) events and 1970's Japanese style shoot fighting - it also provides the perfect challenge for one who feels they have the necessary skills and abilities to fight at the highest level. Breaking into the competitive MMA circuit is a major goal for many young fighters who have either lost interest competing in conventional boxing, wrestling or various martial styles, or who want to test themselves against the very best. I am often asked, usually by younger guys who have very little experience in any form of martial art, how one might train for, and fight in MMA. I usually give them an overview of what the sport involves and ask them if they feel they really have what it takes to commit to what would become one of the hardest undertakings of their life. Possibly The Hardest Undertaking Of Your Life. Before a fighter commits to an MMA program, complete with its diverse array of training techniques, intensive conditioning work and exhaustive sparring, they would be well advised to assess their character and the internal qualities they may or may not possess, as these aspects of fight preparation (the mental factors) are what ultimately separate one who evolves to greatness from one who burns out and becomes disillusioned with the sport. The second major step to MMA stardom involves progressively developing a good cardiovascular and strength base either by oneself' or at one of the many MMA gyms. "Those that followed my previous journal know that I joined an MMA school a couple of weeks back. So here's what my schedule looks like..."
Developing this base (which will involve progressively increasing the intensity of both the cardio and strength components in one's training program) before joining an MMA gym can be a good way to accustom oneself to the demands of intensive training efforts expected in the gym environment. Doing this will also make the transition from regular, or specialized fight training to MMA training, which usually demands a greater sacrifice in terms of both time and commitment (a greater number of skills to be learned and more fitness components to be developed), all the more easier. Although developing this base is essential, the mental requirements needed to stick with the program and overcome the pressure associated with actual confrontation (especially as one begins competing) are fundamental. It has to be remembered that top MMA stars such as Rich Franklin and Chuck Liddell have worked for years to make their mark on the sport and have been blessed with remarkable mental abilities; abilities such as high concentration levels, persistence, and inner strength. Charles David Liddell (born December 17 1969 in Santa Barbara, California), popularly referred to as Chuck Liddell, and also known as "The Iceman," is a mixed martial artist with a background in Kickboxing and Collegiate Wrestling. He currently fights in the Ultimate Fighting Championship and is the UFC Light Heavyweight Champion. Having these abilities, or developing them through attention to how one reacts to certain fight situations and how their thoughts affect their performance, is key to establishing the attitude needed for longevity in this tough, uncompromising sport. It must also be remembered that from the thousands who train and compete in MMA at the lower level, very few make it through to the higher echelons. To make it through, all areas of performance must be assessed, starting with the mental factors upon which a good fighting foundation is based. The following areas in relation to a fighter's psyche can be assessed to determine if one has what it takes to become a champion. If the following steps are taken MMA success will occur at a faster rate. 1. The Ability To Work Through The Pain Barrier. Training for an MMA event takes a tremendous amount of work of various types. Given the complexity of the fighting style MMA requires (a mixed, multidimensional set of skills and abilities), the training involved is often extremely hard and physically exhausting. If one has the ability to continue working through the pain when training gets hard, they will likely go on to the next level, provided they have the fighting ability to compete among this standard of competition. If they can't they will have to satisfy themselves with mediocrity. Often MMA training drills will be set up specifically to test an athlete in this area. For example, sparring will sometimes include fighting for a full round followed by minimal rest before another intensive round with a fresh opponent. The fighter will have to endure several of these. To survive they will need to dig down deep and continue at a high rate of intensity. The mind will govern this process exclusively as it will usually be the first thing to quit when training intensity is elevated. When pushed to the extreme in an MMA fight, the body will need to respond to what the mind is programmed to do. If the mind refuses to give in, the body will follow. An Interview With Martial Arts Expert Julien Greaux. Julien would like to discredit the perception that the martial arts serve as a breeding ground for violent thugs. Learn more about Julien in this great interview and how he is promoting MMA training. 2. The Desire To Reach The Top. Having a deep-seated desire to reach the top to be the very best is one characteristic many of today top MMA stars possess. Their mentality is totally geared towards winning - losing never enters their mind. The moment one lets doubt creep in, they will have placed themselves in a position where dominating an opponent - who has a winning mindset - is next to impossible. Mentality Is Totally Geared Towards Winning. This is another area where the mind will have full control over the outcome. Planning your training with the belief that you will reach the top will help you to push through the pain barrier also. A mind focused on winning will do whatever is necessary to accomplish this aim. Training intensity will become just another obstacle to be surpassed. Knowing that you will win, really feeling this, will manifest itself in heightened performance and the outcome will likely be one of victory. Having the ability to self-motivate is another characteristic many top MMA champions have. Closely related to desire, motivation is the strong internal force that causes us to pursue our goals with full determination. Without it, the training required to become a great fighter will be of low quality, assuming the individual low in motivation ever bothers to turn up to an arranged session. The key to sustaining motivation is to have definite goals and a clear reason for accomplishing these goals. If we are accountable to our goals (for example, we have a coach who has invested much of his time in preparing us for success and disappointing him would bring humiliation) these goals will be easier to achieve. Definite Goals Are The Key To Motivation. The main goal is also to be broken down into smaller steps, thus keeping motivation levels elevated throughout the process. 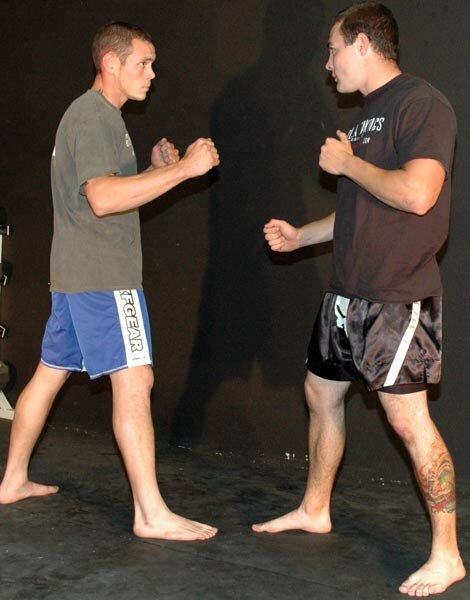 An example of the smaller steps required to compete in an MMA event would be the training sessions needed to develop the required skills. Missing one of these sessions would lessen our chances of achieving this goal. So to develop and sustain motivation we need specific goals, accountability and a desire to be the best. Continually applying sufficient effort to MMA preparation with a determined focus and sense of responsibility is a hallmark of persistence as it applies to MMA success. If one keeps their training continuity at a high level, while building on the momentum they have created as they prepare for a fight, the chances of them winning will have been significantly increased. 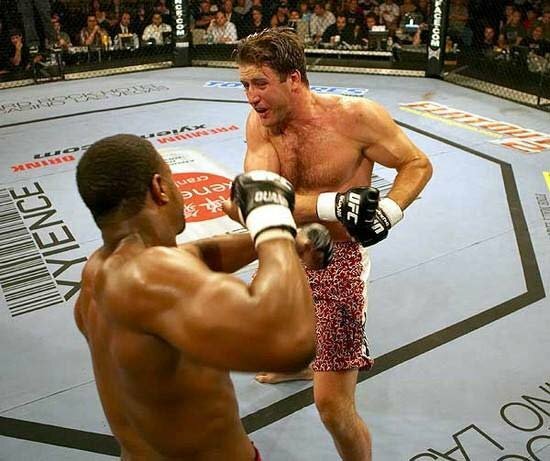 Stephan Bonnar vs Rashad Evens. A persistent mind is one that refuses to give in to whatever stands in its way. A fighter definitely needs to be persistent, as they face many obstacles and the choice to quit is often a desirable one, especially as competition approaches. Keep focused and never give in should be the take home message here. As an active martial artist, bodybuilder and accredited personal trainer, David employs the latest cutting edge research to enhance his own progress.